Q: WHERE CAN I GET CONTENDER APPAREL? A: Contact Kluch Clothing at (888) 321-9665. They are our licensed distributor and can even custom design shirts for your boat. Q: CAN I PURCHASE A BOAT DIRECTLY FROM CONTENDER? A: No, we rely on our dealer network in order to ensure great service close to where you enjoy boating. Q: IS MY BOAT UNDER WARRANTY? A: Our boats have a one year complete systems warranty and a ten year structural hull and deck warranty for original owners only. Q: WHAT IS MY FUEL CAPACITY? A: If your boat is a 2000 or newer, give us a call at the factory and we can provide you with the fuel capacity for your specific boat. You can download the current fuel capacity for each model’s fuel tanks here. Q: HOW SHOULD I SET MY BATTERY SWITCHES WHEN I TURN ON MY BOAT? A: In all normal cases battery switches should reside on “1”. In the event of a low battery you may want to parallel to another battery by setting to “all” or “1+2” until voltage levels normalize. Then, be sure to reset them to 1! For more information on the electrical system please see the users manual available in the Downloads section. Q: HOW DO I WANT TO USE MY FUEL TANK VALVES? A: In single fuel tank boats each motor will have a valve that should remain open during operation. In multi fuel tank boats, each engine will have a valve corresponding to each fuel tank. We recommend burning the saddle (or wing) tanks first and center tank last. Only one valve per engine should be open at a time to avoid causing a fuel imbalance. See the users manual in the downloads section for more details. Q: I’M SMELLING/SEEING FUEL IN THE BILGE OF MY OLDER MODEL CONTENDER. WHAT’S CAUSING THIS? A: First thing is to inspect the fuel lines and hardware located in the bilge i.e. valves, filters, fittings, etc. Corrosion in the bilge is the primary cause for leaks. If the issue cannot be resolved there, then check the sending units, pickups, fill hose and vent hose connections of the fuel tank or tanks. In the worst case it may also be corrosion of the fuel tank itself in which case the tank would need to be repaired or replaced. 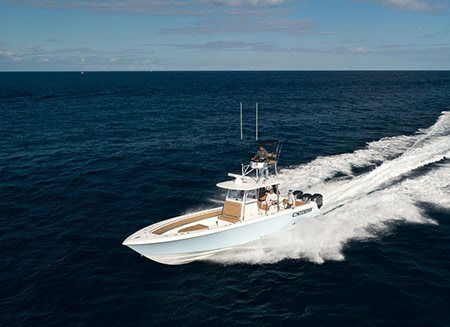 For replacement you can contact sunshine marine fuel tanks at 305-805-9898. Q: CAN YOU SEND ME A CONTENDER BROCHURE? The current Contender Brochure is available here as a PDF File for download.